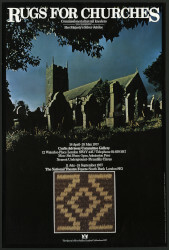 Black and white photograph of John Hinchcliffe with overlaid transparency showing formatting notes for the Crafts Advisory Committee's exhibition publication 'Rugs for Churches'. Hinchcliffe stands with his arms crossed wearing a heavy knit jersey. 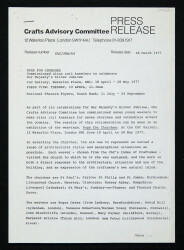 Photograph by Richard Davies. 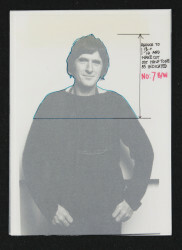 Photograh of John Hinchcliffe, Richard Davies, 1977, © Crafts Council. 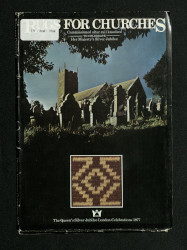 Crafts Council Collection: AM286.